Alfred Stieglitz’ legendary exclamation on first seeing O’Keeffe’s work—‘Finally, a woman on paper!’—tied an indissoluble knot between the photographer-impresario and the young painter. O’Keeffe had already admired Stieglitz for the works he had shown in his gallery, and she and her art-school friends had dreamed of making something Stieglitz would approve of. Stieglitz exhibited O’Keeffe’s drawings without her permission, but when she came to New York after the show, he hung it for her privately and they became lovers: they would marry a few years later, and remain married for the next twenty-five years. Stieglitz and O’Keeffe both took lovers within a few years of their marriage. They would both have brief affairs with Stieglitz’ assistant Paul Strand’s wife Beck, and then Stieglitz would take another young admirer, Dorothy Norman, for a long-term lover. O’Keeffe left New York for Maine and then New Mexico, where she had her own brief affair with Mabel Dodge Luhan’s husband Tony. 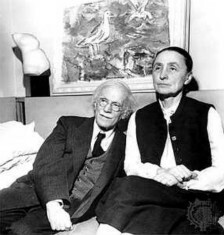 Stieglitz would never admit that he was having affairs, though, and O’Keeffe was too stubborn herself, to ever be inhibited by Stieglitz’ possessiveness, so they remained together even though they both found emotional intimacy in other people. Their numerous affairs and lengthy separations notwithstanding, Stieglitz and O’Keeffe wove each other into their work. Stieglitz’ thousands of photographs of O’Keeffe express both his talent and his deep affection for her, and her paintings both predict and experiment with his theories of abstract photography. Twenty-three years apart in age, their radically different emotional needs drove them in opposite directions at times, but rather than divorce and lose their place at the forefront of each other’s artistic estimation—and sunder the profitable business relationship by which Stieglitz promoted O’Keeffe’s career—they relied on their artistic interpenetration, and found forgiveness, acceptance and a certain degree of caring in spite of their distaste for each other’s affairs.